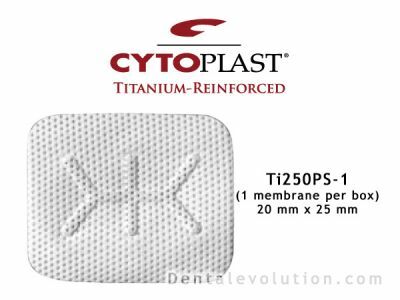 Often used with on-lay grafting in ridge augmentation procedures, Cytoplast® Ti-250 titanium-reinforced membranes provide clinicians with the predictability they are accustomed to with the Cytoplast® TXT-200 membranes, along with the added benefit of a titanium frame to maintain space. These membranes are also popular for adding structural support when grafting 3 or 4-walled extraction sites. Although primary closure in ridge augmentation procedures is recommended, Cytoplast® Ti-250 membranes incorporate a high-density PTFE base (Cytoplast® TXT-200) that is engineered to withstand exposure as long as soft tissue has 360° coverage around the edges of the membrane. The textured Regentex™ surface increases the surface area available for cellular attachment, thereby assisting in stabilization of the membrane and prevention of soft tissue retraction. With eight different membrane configurations, little trimming is necessary to fit a variety of defect sizes. However, the membranes can be trimmed according to clinicians’ needs. *Recommend use with Cytoplast® PTFE Suture.